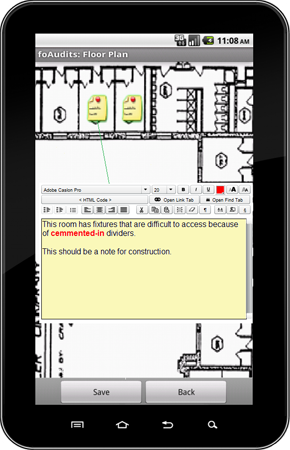 foAudits (Fundamental Objects Auditing Toolset) is a PDA-based, handheld auditing tool for energy audits, inspections and surveys. foAudits has versions for Android, QNX, iOS, and Windows Mobile devices, among others; as well as browser-based versions for netbooks, tablets, laptops and desktops. You can create your own audits, or use one of the audits that are supplied with the package. Audit templates are first created or placed within a server database, which is optionally provided with the tool. You can enter and use your own customer list within this database. This allows you to have one person to set up audits for a number of inspectors in advance of each day's work. Once completed in the field, the audits are then Hotsynced (copied), ActiveSynced or otherwise moved back into the server database. From there you can use the supplied reporting features, or move the captured data to another one of your systems. You may also wish to see our online, adhoc report-writer, foReports. Import your Customer & Code Lists. You choose the number of stars, and what (e.g., 4) to seed it to. For details on pricing, click here. Web-enabled Phone applications are the perfect solution for contractors, inspectors and auditors. Using only a phone eliminates carrying multiple devices and is a more natural way to work for many people. For information about online web energy audits, click here.